With abundant rainfall, and covering several climatic zones (especially when counting its far outlying islands), Japan is a country quite rich in tree species ( and is in fact the most heavilly forested- mostly with cedar in the present time, of all the major industrialized nations). I would even GO OUT ON A LIMB and claim that the Japanese have created the most sublime of all the world`s wood civilizations. What gives me the confidence to say this, is that it was not only the common folk who used wood for making just about everything- but the higher classes as well. And while the national treasures of most other wood-rich civilizations are often made of diamond, gold, silver, ivory, or stone, in Japan a high percentage of the most treasured human creations: Buddhist temples and statues, Shinto Shrines, palaces, castles(! ), private homes, as well as a fantastic assortment of crafts- are made of wood ! Many of these are things of overwhelming beauty. And naturally, over the millenia, the people who have lived among all these trees learned how to use each particular species to best effect- whether for creating dyes, tools, crafts, buildings, musical instruments, or medicines ( among other things). That is why, one interesting question that often arises when examining various aspects of Japanese culture is WHAT WOOD IS IT MADE OF? The person whom I always consult on such matters ( and I do so quite often) is Dr. Hisashi Abe, a tree anatomist who lives in Tsukuba. No matter how often I have pestered him with questions on the identity of trees or wood, he has never failed to get back to me with the answer- even if it has meant lots of trouble for him. 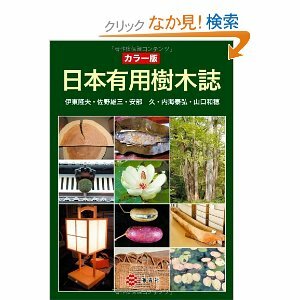 And since Abe-San and his colleagues realized that there were several guides to Japan`s trees, but none on Japanese WOOD, they decided to alleviate the situation- by creating a new, full color guide called: (KARA-BAN) NIHON YU-YO-JUMOKU SHI (カラー版日本有用樹木誌)- and Useful trees of Japan: a color guide, in English ( though the text is in Japanese only). The project really got underway 5 or 6 years ago when several of Abe`s colleagues got together for a retirement party held for Professor Itoh of Kyoto University, who also happened to be the curator of that distinguished institution`s xylarium ( wood specimen collection). Itoh, Professor Emeritus at Kyoto and a Professor of Nanjing Forest University, Dr. Sano, lecturer at Hokkaido University, Dr. Utsumi, an Assistant Professor of Kyushu University, Dr. Yamaguchi, Senior Researcher of the Tree Breeding Center, and Dr. Abe had collaborated on a big project several years earlier and decided to pool their efforts once again into the project of creating this new book. What they first had to do was select what they thought were the most important tree/wood species- and they eventually settled on 230 (out of Japan`s 1,300). They then had to set about gathering information on every aspect of these species` uses in Japanese culture and history. The woods selected by Abe and his colleagues include those with very long presences in Japan as well as the many which were introduced after the Meiji Restoration of 1868 ( for example the dogwood- which came to Japan as a gift from the US in exchange for the cherry trees which now grow in Washington DC and along the Potomac River). After a few years of research, discussion, and editing, the book finally came out in July of this year (2011). I of course acquired a copy, and for the past few months have kept it close at hand. It has really enriched my understanding of the role trees and wood have played in the culture which developed in the Japanese Archipelago. Let me mention just A FEW of the things which I have found interesting in the book. The most important Japanese tree is probably the cedar (sugi). Reading the section on SUGI ( a tree which I am VERY WELL aware of- since its pollen makes me suffer horribly each spring) I found out that in the archaeological record, cedar trees originally only grew on the Japan Sea side of Japan. The oldest evidence of the use of this wood on this side of the country( the Pacific side), is the remains of cedarwood TAGETA ( wooden clogs used for walking in rice fields), apparently used in the Yayoi Period, which were unearthed in Shizuoka Prefecture. The tallest individual cedar in Japan now grows in Akita Prefecture and stands at 55 meters. One reason that SUGI wood has been so popular is that the tree grows so fast ( that is why after the great deforestations during WWII the governenment supported a policy of extensive cedar plantation). Sugi has long been the source of wood for building the homes of commoners ( while HINOKI- cypress was used very frequently for upper-scale buildings), especially in the Edo Period. And though it was abundant and cheaper, it is still beautifully grained and used for the interiors of homes. 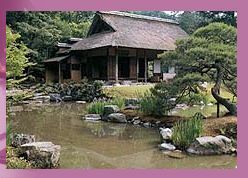 Despite its popularity among the common folk, there is even an instance in which one of the most exquisite examples of classical Japanese architecture is built with the generous use of cedar- the Katsura Rikyu Imperial Villa in Kyoto. 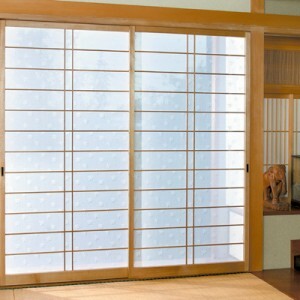 Cedar has long been used to make the frames of shoji ( paper square) sliding doors. Knowing that, anyone who has lived in Japan and touched those doors, has a sense of what this wood is like- light weight ( and light colored) and soft to the touch. 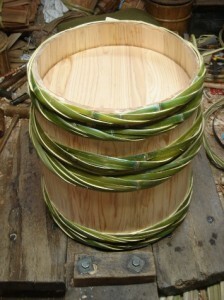 Sugi has also played an important role in SAKE making as the barrels used for the brewing process are made of it. The wood lends a distinctive flavor to the final product. 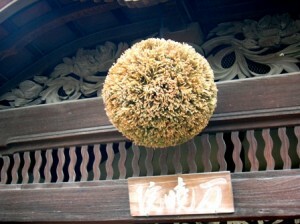 To announce that the year`s new sake is ready, breweries and shops hang large ball made of cedar leaves ( these are called SUGI TAMA) over their entrance-ways. Cedar bark is often used to make the roofs of temples and shrines ( this year the Grand Shrine of Izumo had its roof of sugi-bark slats replaced). This wood was also the preferred material for making sea-going craft, especially in the Edo Period. After the Meiji Restoration and the eventual introduction of utility poles, it was sugi that was given the dubious honor of being selected as the most suitable timber for that purpose- with cedar the list of uses goes on and on………. The next tree/wood that I looked up in the book was KEYAKI ( zelkova, in English), a tree which before coming to Tsukuba I had never heard of but is one of the most familiar ( and outstanding) trees in this area. I used to have a grand old KEYAKI growing in the garden of my old house in Konda ( I had to abandon that place after the earthquake), and that is why I wanted to learn more about its uses. The zelkova section of the book correctly appropriately explains that this tree is common in the kanto area and a popular tree to have planted on the grounds of private homes. Keyaki wood was also used to make some of Japan`s most famous old temples- including Kyoto`s most popular sight-seeing spot: the Kiyomizu Temple. Keyaki is also used as the base for Japan`s famous lacquerware. Also a fast growing tree, its trunks are still used as the columns for temples ( as well as for the frames of Japanese drums and the large hammers and mortars used for making O-mochi pounded rice cakes). And now let me select another tree to take a look at, this time something much less familiar- AH…..here is one that I have never even heard of- the KOYAMAKI ( or in English- the umbrella pine) ! Lets see what Dr. Abe and his co-authors have to say. Amazing! This species makes up a whole family and genus of its own- and while it still can be found growing between Fukushima Prefecture in the north and Miyazaki Prefecture in the south, it is Red-Listed in nearly all the Prefectures within its habitat. These trees can be found growing is healthier numbers in in Wakayama, Nara, some parts of Shikoku and in the Kiso valley ( Nagano Prefecture). In ancient Japan the wood from this tree was deemed best to make coffins- because it is very slow to decay. Numerous such coffins have been discovered by archaelogists in the Kinki Region (around Nara and Kyoto). No one knows, however, why numerous coffins made of the same wood have been unearthed in Korea, as well- since the KOYAMAKI does not grow on the Peninsula. Did this species once grow there and become extinct at some point, or was the wood ( or the coffns themselves) exported? Three types of trees/wood down, 247 more to go! I will continue to add more interesting tidbits to this post now and then, so keep checking. But if you are really interested in the topic ( and read Japanese)- order the book from Amazon, or directly from the Kaiseisha Press which has published it. Coincidentally, I found an article in the Nikkei newspaper dated 22 November. The article is about Dr Mechtild Mertz, who is a writer of the book “Wood and Traditional Woodworking in Japan”. She works with Professor Itoh, and, I know her very well. I will send a copy of the article and her details later. Thank you Abe-san for mentioning my book and paper in the Nikkei newspaper. I just found this blog … in English! It’s very nice.